LA Unified school board President Mónica García at the Nov. 14 board meeting. The city’s education community sent a clear message Tuesday from downtown Los Angeles to legislators in Sacramento: the governor’s funding formula has not “fixed” the state’s woefully underfunded public education system. The LA Unified school board unanimously approved a resolution to spend resources to advocate in Sacramento to double education funding by 2020 to $20,000 in per-pupil revenue for students in public schools. Numerous organizations expressed their support for the board’s action. “You took a bold step already in approving a resolution that will, in fact, help us to change the narrative,” said Jeff Dunn, the district’s new director of government relations. “To the uninformed legislator that is not really in the education policy space, they see the fact that we changed the funding formula … (and might say) ‘What is the problem? We’ve fixed education.’ We know that, of course, is not the case. The figures are real. It’s not hocus pocus,” Dunn said. The resolution was authored by school board member Kelly Gonez. It initially also called for funding to increase to $25,000 by 2022, but it was amended during Tuesday’s meeting to remove that part of the language. “In working with our co-sponsors, we wanted to recognize that there are barriers to raising per-pupil funding, but despite these challenges, Sacramento must commit to dramatically increasing funding so that our schools get the investment they deserve,” Gonez’s chief of staff, Megan Vandenbos, said in an email. Gonez was joined by her board colleagues George McKenna and Nick Melvoin as co-sponsors. The resolution cites an EdWeek analysis of National Center for Education Statistics data that ranks California at 46th in the nation when it comes to per-pupil spending. When the district’s chief financial officer, Scott Price, was asked about this number, he acknowledged that ranking was based on 2014 data. Another ranking from the California Budget & Policy Center using 2015-16 data puts California at 41st in the nation in per-pupil spending when factoring in cost-of-living in each state. 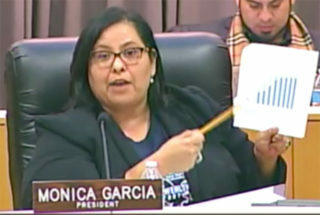 “We are still far below the national average, and the crisis in funding schools is mitigated by people saying it’s not as bad,” school board President Mónica García said. “It is appalling that a state as wealthy and as rich as California lies at 46th in the nation,” Dunn said. New York state spent about $18,191 in per-pupil spending in 2014. Dunn noted one difference between California and New York. New York does not have Prop. 13, which limits increases in property tax assessments in California. • Read more: LAUSD is poised to join a big push to get more per-pupil money from the state. But where is California ranked, really? Price gave a presentation that summarized the revenue challenges that LA Unified faces. LA Unified Chief Financial Officer Scott Price giving a budget presentation to the board on Nov. 14. There is a misconception that the Local Control Funding Formula, authored by Gov. Jerry Brown and enacted in 2013, “fixed” the budget challenges experienced during the recession, district officials said. 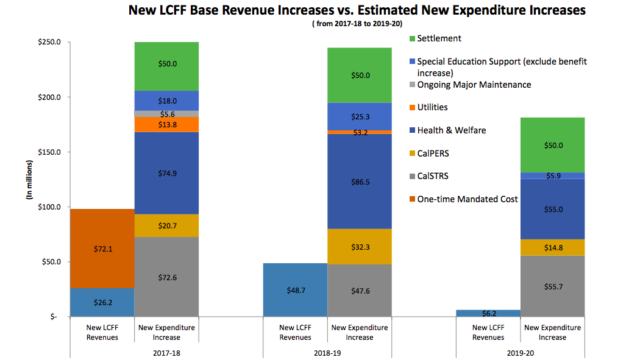 LCFF gives more funds to districts that have higher numbers of students who are low-income, English learners, homeless, and foster youth and gives districts more flexibility in spending. During the recession, the state borrowed money from K-12 education to pay for other state budgetary needs as the economy was spiraling, officials said. Price said the state has repaid the K-12 funding it borrowed during the recession and education revenue is now at pre-recession levels. However, a decade later, health-care costs continue to rise and the district has had to contribute more toward employee pensions in order to reduce the unfunded liability owed to retirees. “It’s really eye-opening that our (increases in) STRS and PERS (contributions) alone almost equal our LCFF revenue,” Gonez said. CalSTRS is the state’s teacher retirement system, and CalPERS is the state’s public employee retirement system. Districts receive money based on “average daily attendance,” which is based on enrollment. LA Unified’s enrollment has declined steadily since 2002-03. The district loses about 13,000 to 14,000 students a year. “We are in severe declining enrollment,” Price said. Although the state has increased its per-pupil allocation year-to-year, enrollment has decreased in LA Unified so rapidly and has been accompanied by increased costs, that the increase has not benefited the district as much as some people may think, Price said. The governor gave the district an additional $72.1 million in one-time spending this year, but school board member Richard Vladovic criticized one-time spending allocations, saying they are not sustainable to pay for ongoing costs. “Even though we’ve received new revenues, we’re getting further in the hole,” Price said. “If the state is improving, but we have fewer students enrolled, we have to adjust the revenue structure,” Price said. Looking forward, the district has to submit three years of budget projections to the LA County Office of Education. In the third year, 2019-20, the additional revenue that the district is slated to receive — $6.2 million — does not cover the cost of projected increases in expenses: $181.4 million. Acting Superintendent Vivian Ekchian said the “transparent conversation” was necessary but unpleasant. “It’s real. In reality, we’ve moved to 80 percent graduation with very few funds,” she said. Next month the board will hear a presentation on its first interim report on spending so far in this budget year. The governor releases his initial proposal for next year’s budget in January. García announced that the board will hold a special meeting in two weeks on the budget. A number of organizations voiced their support for the board’s decision including Partnership for Los Angeles Schools, Alliance for a Better Community, and the United Way of Greater Los Angeles. Ama Nyamekye, executive director of Educators for Excellence Los Angeles, told the board she hopes the district not only advocates for more dollars but that it invests those funds equitably. LA Chamber of Commerce Executive Vice President David Rattray, who oversees educational programs, said he hopes the district’s advocacy will include the message that LA Unified has surpassed the state average when it comes to the percentage of students who graduate eligible for the state’s public university systems in spite of inadequate funding. “We’ve got to break the myth that LAUSD is not one of the best districts in the country,” Rattray said. The Los Angeles teachers union, UTLA, and other labor groups are also calling for $20,000 per-pupil funding by 2020. 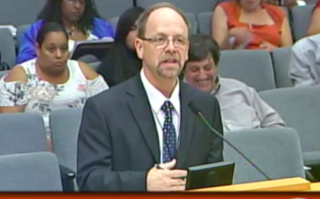 However, no representative from UTLA addressed the board. UTLA had asked the district to join their call as part of contract negotiations. Ekchian thanked labor leaders for their collaboration on this issue. It’s time for Sacramento to fully invest our education. In other business Tuesday, the board unanimously approved a resolution authored by Melvoin to create an LA Unified mobile app. District officials will seek input from parents as to what information they would like to see included as part of the app and will release a plan in January to be considered by the board.